“I don’t know about this.” That was the first thought that ran through my mind as I pulled the black and white striped dress with the faux leather pockets out of the box from Cypress & 5th. But, then I tried it on. Now, I know you’re asking, “Amelia, how does fashion have anything to do with fitness and wellness? ?” Well, y’all, for me one of the keys to feeling good (both mentally and physically) is looking good. People always want things to be black and white. But when it comes to wellness, so many aspects of our lives feed into this. I have to say that the items in my dressing room were pretty spot on to my taste. But, it included the kind of items I wouldn’t necessarily choose for myself (I’m kind of a creature of habit) — but when I put them on I love them. Out of my dressing room options, I went with the above-mentioned dress and a selection of earrings. Now, back to me trying on that dress. My hesitancy had stemmed from the cut. I have broad shoulders and no hips, so a T-shirt-style dress like this with a crew neck and the length (a smidge longer than I’d normally go with) doesn’t usually fit well. But this one did — I love it!! Throughout the fall, I’ve worn it regularly with my favorite black boots (and have received plenty of compliments, too). Also, I’m not usually one to deviate from my pair of pearl and diamond stud earrings, but I’ve even loved the options that I received with the dress. And the icing on the awesome box of goodies cake was the cute Cypress & 5th reusable tote bag that everything came in — marketing genius. 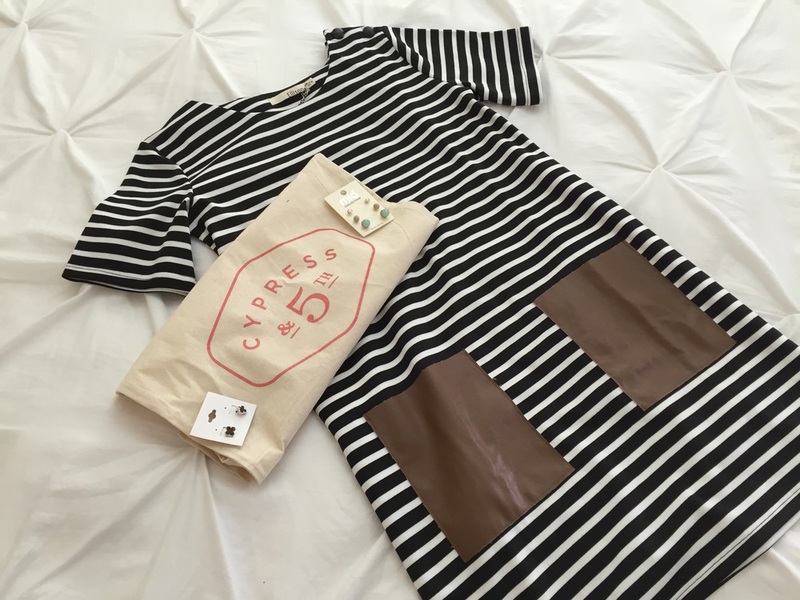 Needless to say, this experience with Cypress & 5th was a “fit” — literally! Gone Blogcationing — See You in 2016!